Create a critterproof vending machine for your girls. Frank Hyman has been a columnist for Chickens magazine for several years, so of course someone was going to ask him to write a book! 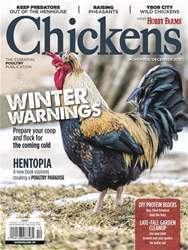 However, a simple text about keeping chickens doesn’t fit this lively, humorous writer, who’s covered everything from coop construction to building a wormbin buffet for his hens. No, he’s not interested in just keeping chickens but creating a hentopia for them, which is the name of his new book: Hentopia: Create a hassle-free habitat for happy chickens. His book offers 21 innovative projects for chicken keepers all of skill levels and is on sale now.